After Friday night’s pregnancy health scare I’ve been doing my very best to take it easy this week. But anyone with kids and a job will know that taking it easy is easier said than done. I’ve scaled back some of my radio shifts, but I’ve still got deadlines coming out of my ears. Plus, in a spectacular act of bad timing, the husband was landed with a week from work hell too, which has meant he’s been working til gone midnight most nights and I’ve been on my own with our almost-four year old. An almost-four year old who has decided to wake up at 2am for the last few nights and not go back to sleep. Still, amidst the mayhem there have been moments of calm. At 23 weeks, my bump is really starting to get rounder – meaning I can finally fit properly into my new maternity tankini by Mamalicious (review coming up soon). I wore it to a session of aquanatal this week – my weekly pregnancy exercise session. I find it’s the one time in the week when I can totally indulge in being pregnant, chatting to other mums-to-be. The bit at the end is my favourite, when we float around the pool to relaxation music. Mmmmmmm. There was also a special moment on earlier in the week, when the NLM and Frog felt the baby kick for the first time. When I was pregnant with Frog four years ago I used to get that weird alien look when you’d see the shape of a foot or an elbow poking through my belly. With this pregnancy that’s unlikely, as my placenta is at the front. Still, despite being told I may not feel much movement at the front of my bump, this baby is showing me he or she is very much there, with plenty of strong kicks. So tell me, how has your week been? Link up your latest pregnancy post here and tell us all about it. Don’t forget to grab the badge to display on your blog to tell the rest of the world about our online antenatal club too. 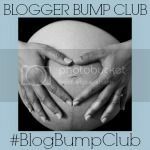 And, if you want to, you can tweet me a link to your post (I’m @mollyjforbes on Twitter) using the hashtag #BlogBumpClub to join the chat there too. I’m so glad everything is ok! I can’t imagine how hard it is to try and take it easy! especially with those restless legs and the nesting going on. I hate it when i get told to sit down and chill out! I also love it when i can feel baby E kicking! It takes a while to get used to but it something you’ll never forget! Ah thank you – and you’re right, taking it easy is certainly easier said than done! That was quite a pregnancy scare you had. I’m still laughing at myself for ending up in the ER during my first trimester because I freaked out over a bad case of gas – I thought something was terribly wrong due to acute pain that left me doubled over. I was glad to know that my baby was okay though. Even though last week was rough, it’s beautiful that this one ended with your loved ones feeling the baby kick. I’m 35 weeks so far and my placenta is posterior so I can totally relate to that alien feeling you described – I’m always trying to guess the baby’s position based on that but it’s tricky. At this point, I’m feeling…full, very full and heavy all the time. But I love feeling so close to my little one and I can’t wait to meet them! Anyway, glad you’re okay and I look forward to reading more of your blogs. Ah but bad gas is very painful! Hope you’re managing to get some rest and put your feet up. That heavy feeling is a strange one isn’t it?! It’s really incredible isn’t it? Glad to hear you saw movements with Paige even though your placenta was at the front. I liked that element (although it was strange!) with F and would quite like to experience it again this time around. It’s one of my most favourite parts of being pregnant, feeling the baby kick. When Frog was in my tummy I used to see her move all the time. Pretty incredible – used to properly freak my husband out! So exciting when others can feel the kicks!I had anterior placenta wit youngest but still felt plenty of good hard boots from him! Judging by both scans I’ve had and the fact baby has given him / herself hiccups every time they’ve listened to the heartbeat, I’m pretty sure this one is a little wriggler with very strong feet! Oh how lovely! I can’t wait for the kids and husband to feel what I can feel! So glad you’re at least attempting to take it easy after Friday. And good to hear the aqua natal is going well- I joined the local swanky hotel’s pool this week and have been swimming lots too. Must try floating! Thanks for hosting once more, I love reading everyone else’s posts and I need to catch up from last week now!